I could and certainly did paper piece the whole block. So all the points are matching perfectly. I could safely use my stripe print and I think it looks wonderful here. And there was a centre I could fussy cut. This is a block I can absolutely recommend for anyone who is distracted, crabby, or simply feeling blue. 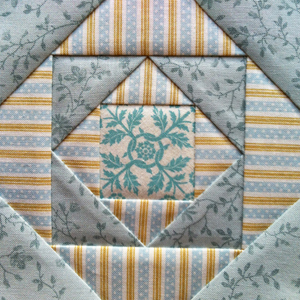 Posted in Uncategorized and tagged farmer's wife, farmer’s wife quilt, gentlemans fancy, gentlemans fancy block, quilt, quilt block. Bookmark the permalink. Hoe canvas i find the patterns?